An armed soldier enters the stadium where the coffin of the late Zambian President Michael Sata was draped in Zambia’s flag at the funeral in Lusaka, Nov, 11, 2014 (AP photo by Tsvangirayi Mukwazhi). 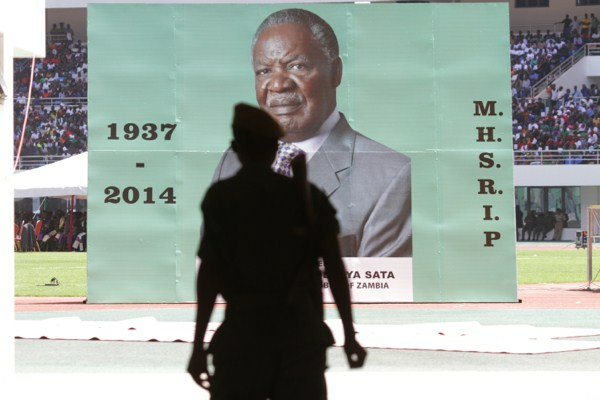 The death in October of Zambian President Michael Sata has brought internal rivalries to a boiling point not only in his ruling Patriotic Front (PF), but also in the main opposition parties. The infighting, which has already seen some political heavyweights switching parties in order to satisfy their ambitions, complicates efforts to predict the outcome of Zambia’s presidential election on Jan. 20. Amid all the mud-slinging and legal challenges, there has so far been little time for policy discussion in Africa’s second-largest copper producer. Instead, voters are witnessing an unedifying spectacle of name-calling, scheming and internecine squabbling.